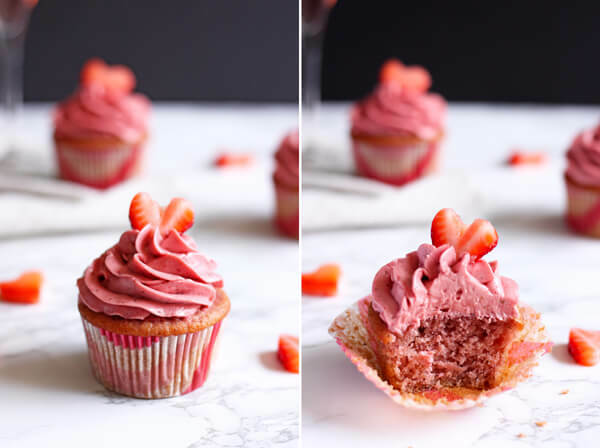 These Strawberry Champagne Cupcakes are made with soft and moist strawberry cupcakes topped with a creamy and tangy Moscato infused strawberry cream cheese frosting. They’re perfect for any celebration! And now it begins, all the berries filled recipes are going to flood your feed for the next couple weeks. We started earlier this week with these Raspberry White Chocolate Chip Muffins. Today, we have a dozen Strawberry Champagne Cupcakes! 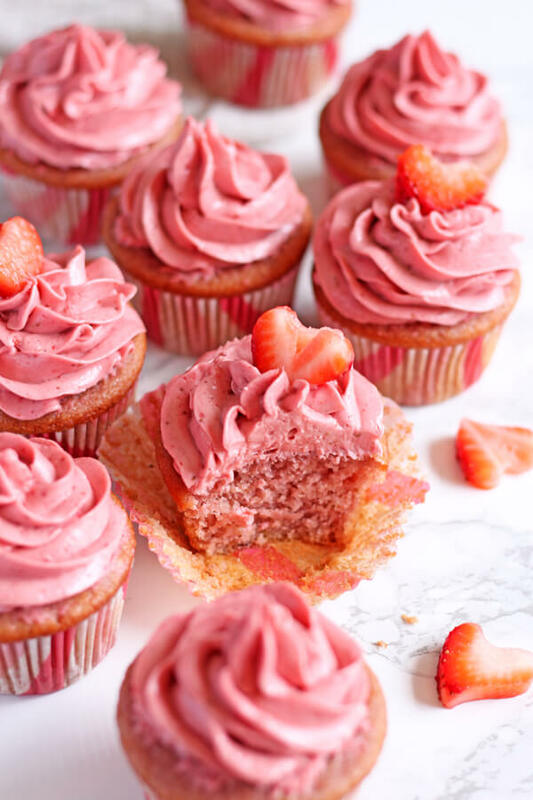 Strawberry cupcakes topped with a Pink Moscato strawberry cream cheese frosting. I know it is almost last minute to Easter, but I thought these could work for a fun Easter brunch. If not, you should pin them for the next party on your calendar. I’m sure there’s a birthday coming up at some point, or a bridal shower, a bachelorette party? 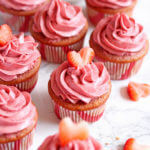 These strawberry champagne cupcakes are soft and moist thanks to all the pureed strawberry in the batter. The cake is not too sweet, and is just the perfect base for the creamy, tangy frosting. 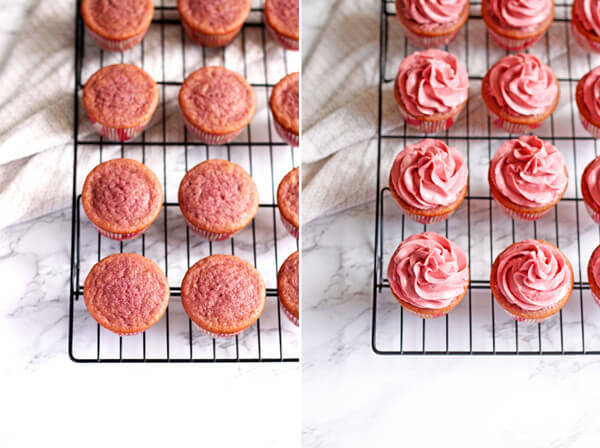 The sweet Pink Moscato is a fun addition which blends in effortlessly with the strawberry frosting. And of course, these also go well with the left-over bottle of Moscato. 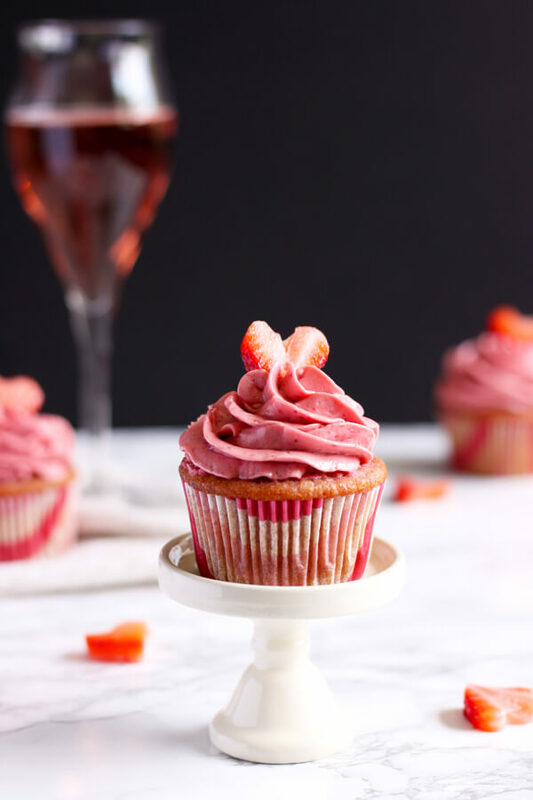 Cupcake and sparkling wine, what a pair! The recipe calls for 8 drops of red food coloring, this is entirely optional. The food color is only needed if you want the cake to look pink. When I made these cupcakes without the food color, the batter baked up to a funky purple-ish grey-ish color. However, they still taste good. If you don’t care what color your cake will turn out, skip the food color, plus the frosting will cover up the top of the cakes anyways. So, what are you waiting for? Go get yourself a bottle of Moscato and get baking! 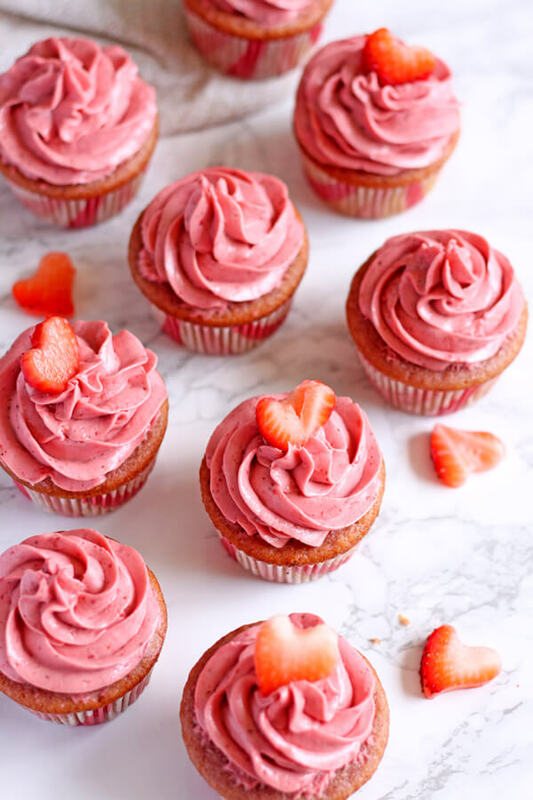 These Strawberry Champagne Cupcakes are made with soft and moist strawberry cupcakes topped with a creamy and tangy Moscato infused strawberry cream cheese frosting. In a small bowl, measure out flour, salt, baking soda, baking powder, and sugar, mix well with a whisk and set aside. Puree 1 cup of chopped strawberry in a food processor, this will yield approximately 1/2 cup of pureed strawberry. Add the pureed strawberry, buttermilk, oil, egg, vanilla extract and food color in a medium bowl and beat with a whisk to combine. Bake for 20 minutes until an inserted toothpick in the middle of the cupcake comes out clean. Ground the freeze-dried strawberry in a food processor until a powder form. Add powder sugar and powder freeze-dried strawberry, and mix to combine. Finally, add Moscato to the frosting and mix well. 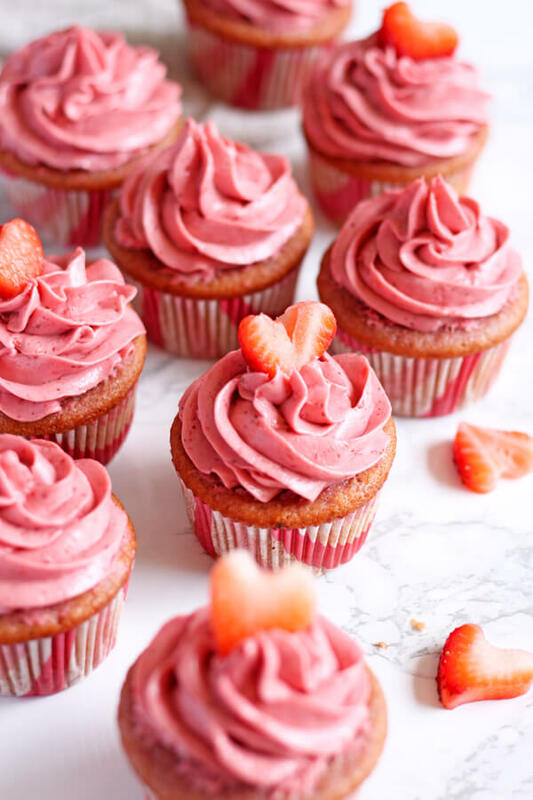 Garnish cupcakes with sliced strawberries as desired. 1. I make the cupcake batter using just a hand whisk. You can use an electric mixer as well, just be sure to not overmix the batter. 4. 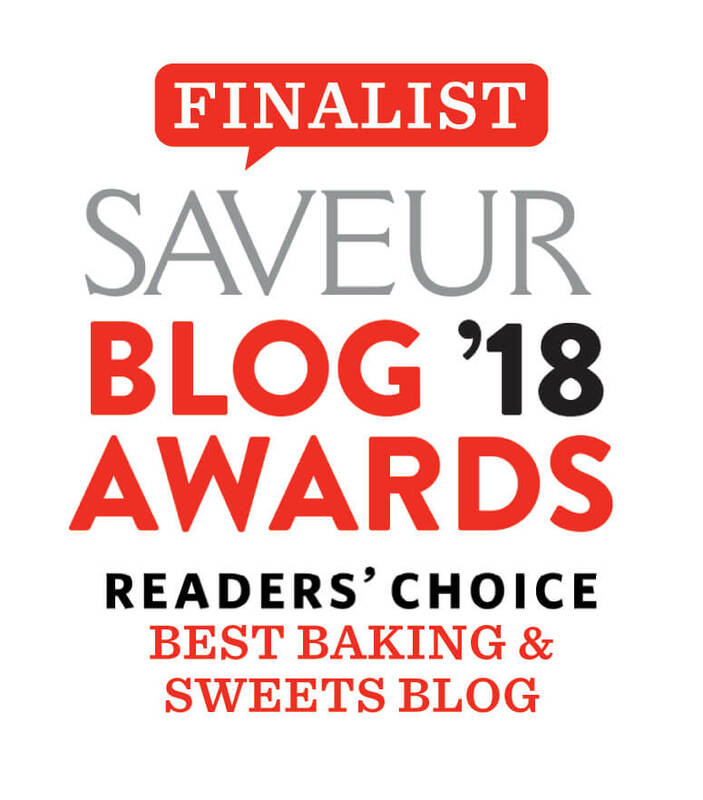 I used a food processor to puree the fresh strawberry and ground the freeze-dried strawberry, but a blender should also work if you don’t have a food processor. 5. Red food color is optional for a more visible pink cake batter.